The race for the Democratic National Committee Chairperson is very important. In case you haven’t been following it, there are many candidates running, but only two major contenders: Keith Ellison, Democratic Congressman from Minnesota’s 5th congressional district for 10 years straight, and Tom Perez, the Secretary of Labor from the Obama Administration. The winner of the race, who will be chosen during the weekend of February 24 by 447 party insiders, will run fundraising, outreach, and primary processes for the Democratic Party over the next several years. Overall, Ellison has stronger social justice credentials than Perez – he’s been an active Co-Chair of the Congressional Progressive Caucus and has put forward some of the most progressive economic justice legislation in Congress during his time there. He’s been a staunch advocate for unions, was an early supporter of a $15 minimum wage, and was an early opponent of the Trans-Pacific Partnership (TPP) and other trade deals that are more about enriching multinational corporations than promoting the free exchange of goods and services. His voting record on women’s rights, LGBT rights, anti-racist policy – you name it – is excellent. And before coming to Congress, Ellison worked in civil rights and employment law. But Perez deserves a fair bit of credit for his record, too. As the Labor Secretary, Perez went after companies that stole from their workers, embraced policies that would raise the pay of and increase opportunities for members of underserved groups to become federal employees and contractors, and pushed forward a rule that would reestablish the right to overtime pay for millions of workers. His active support for the TPP is a non-trivial stain on his résumé, but those who believe in social justice should generally like the policies he’s pursued, as others have also noted. Yet if that’s the case, why is it so important that Ellison wins? The answer to that question lies in the answer to another: why is Perez even running? – Ellison was one of the few Democrats calling for the party and media to take Donald Trump seriously from the beginning. The clip below, from a panel Ellison did back in July of 2015, is the most striking illustration of the contrast between Ellison’s prescience and the irresponsibility of the vast majority of Establishment media figures and politicians during the course of the 2016 election. – Ellison was the second congressperson to endorse Bernie Sanders during the Democratic primary, and one of only a small handful to have done so at all. Many other federal policymakers also had backgrounds more aligned with Sanders than with Hillary Clinton but backed Clinton anyway, possibly because of some combination of a misguided sense of political pragmatism and a legitimate fear of retribution. Given that Sanders was much more popular than Clinton among Independents and the most popular primary candidate ever among young people, whose energy and enthusiasm Democrats desperately need in the future, it makes strategic sense for the party to put one of his early supporters in a leadership role. Doing so would suggest that the Democrats, after throwing a ton of institutional weight behind the less electable, less social-justice-oriented candidate (and failing to hold party leaders accountable for their clear violations of the DNC’s charter) en route to squandering the 2016 election, have learned something. It would give hope that the Democrats may run a fairer, more democratic primary process next time, and that those who opposed Clinton needn’t write the party off entirely. – Once Sanders lost the primary, Ellison helped draft the DNC platform and became an outspoken proponent of voting for Clinton. He campaigned very hard for Clinton between July and November. He showed, in other words, that even though he thinks there is a better path than the one the Democratic Party is currently on, he believes in working within the Democratic Party structure for change. I would have personally preferred Ellison to not campaign for Clinton, but I respected his choice to do so, and the fact that he did – vociferously – makes him an ideal candidate for party unification. So does the fact that, unlike Sanders, Ellison is Black and Muslim, and his ascendance would diversify Democratic Party leadership, a worthy objective that Clinton fans have long claimed to support. Ellison can potentially bridge the gap between good-faith Clinton and Sanders supporters and grow a bigger Democratic coalition. Establishment Democrats and big-name donors began attacking Ellison as soon as he declared his interest in being DNC Chair, however. They first complained that chairmanship was a full-time job and that, as a sitting congressman, Ellison wouldn’t have the bandwidth to focus on it. They then inaccurately cast Ellison as an anti-Semite, misconstruing a 2010 speech he gave and condemnations of White supremacy and Israeli policy that he made twenty-five years ago. Ellison soon thereafter declared that he would resign from Congress and become DNC Chair full-time if he wins the race, and he has repeatedly proven allegations of anti-Semitism false, but no matter; the Clinton/Obama apparatus wanted a challenger, and when Howard Dean didn’t pan out, they pressured Perez to step in. He formally entered the race on December 15. Perez has presented little that looks different from what Ellison has proposed, and nobody has offered a coherent explanation for why they think he’d do a better job leading the party than Ellison would. Endorsements of Perez, like the one Joe Biden just made, have just highlighted personal details about him and included vague statements that could at least as easily apply to Ellison. It’s thus hard to understand why Perez would have thrown his hat into the DNC Chair race (as opposed to the Maryland gubernatorial race) if not to maintain the Democratic Party’s current power structure. The message to those who supported Sanders and want the party to embrace full-scale social and economic justice – many of whom are already upset that Perez pushed some of the Clinton campaign’s disingenuous attacks on Sanders behind the scenes during the primary – seems to be that they’re still expected to fall in line and support whatever the party Establishment decides. Some Democrats lashed out at Sanders after this statement. They were, according to The Hill, “frustrated by press reports characterizing the contest as a proxy battle between the party’s leftist Sanders wing, represented by Ellison, and a more moderate Barack Obama-Clinton wing, represented by Perez.” But to think otherwise is naïve – that’s precisely what it is. And as some politicians, union leaders, and media figures who backed Clinton have already recognized, the smart move for Democrats who want to see the party win in the future “would be…to embrace Keith Ellison as DNC Chair.” That would be the right move for those who believe in social and economic justice as well. These reactions misunderstand and condescend to millennials and ignore vital context about two main points. First, millennials have very good reasons to oppose a Clinton presidency. As I’ve tried to explain to Drum before (he has ignored me), many millennials, myself included, grew up with his perception of Hillary Clinton – that she is a good Democrat fighting the mean Republicans and subject to a relentless stream of unfair criticism from the corporate press. It has only been during my adult life, after a lot of research, that I’ve developed my current view: Clinton may sometimes be the subject of unfair press coverage, but she also has a large, influential group of media cheerleaders and has been on the wrong side of numerous issues important to populations I care about: war, criminal justice, immigrant rights, LGBT rights, the death penalty, international trade, and anti-poverty policy, to name a few. Drum’s idea that Bernie Sanders’ accurate critiques of Hillary Clinton’s record hoodwinked millennials into our current views is both patronizing and inaccurate. Which brings me to my second point: while it’s perfectly fine for someone to believe that defeating Trump should be our top priority, anyone espousing that viewpoint should have supported Bernie Sanders in the Democratic primary. The evidence overwhelmingly indicated – for months, getting stronger all the time – that Sanders would have been more likely than Clinton to beat Trump in a general election matchup. The only rebuttal to that evidence – that Sanders hadn’t faced real criticism and that his numbers would tank when he did, if he eventually became the nominee – fell apart very quickly upon inspection. The third-party candidates draw their strongest support from younger voters. Twenty-six percent of voters ages 18 to 29 say they plan to vote for Mr. Johnson, and another 10 percent back Ms. Stein. A little more than one in five political independents say they will vote for one of the third-party candidates. Drum points out that millennial support for third-party candidates in the referenced poll is a bit higher than it typically appears to be (he also links to a FiveThirtyEight analysis suggesting that it is strongest among people under 25), but he admits that “Clinton is clearly doing worse among millennials than Obama did four years ago.” These results were completely predictable; millennials and independents were the groups among which Sanders most dominated Clinton in the primary and are two constituencies for whom support for Democrats (and/or showing up in November) is most likely to be conditional. “Voters in these groups – unlike voters in Clinton’s key constituencies – may very well abandon the Democrats if Clinton is the party’s nominee,” I wrote in March. That’s exactly what appears to be happening. Despite the foreseeability of this result during the primary, Drum asserted that Clinton was “almost certain to be more electable in November than a self-declared democratic socialist,” citing exactly no evidence to back up this claim. It seems odd that he, Jeffery, and other Democrats spent so little of their time analyzing the electability evidence during the primary, given their intense focus on beating Trump today. If they had, they would have known what people like me had been trying to tell them for a very long time – large numbers of millennials and Independents who would vote for Sanders might very well not vote for Clinton – and, if beating Trump was their prime objective, spent their time pleading with older Democratic voters to support Sanders. Millennial voting patterns are thus not only a product of voters’ legitimate analyses and electoral strategy; they’re also entirely expected. Those upset about them who backed Clinton in the primary and/or advanced the incorrect notion that she was more electable than Sanders have nobody to “hate” but themselves. As an outspoken supporter of Green Party presidential candidate Jill Stein, I often get questions akin to the one Stein was asked at the Green Town Hall on August 17: “Given the way our political system works, effectively you could help Donald Trump like Ralph Nader helped George Bush in 2000. How could you sleep at night?” More often than not, such questions are followed by the claim that voting for Stein in November is an act of self-indulgent privilege. Only those with little to lose from a Donald Trump presidency can afford to risk it by adhering to a rigid set of principles that will never come to fruition, third-party critics argue; people who might suffer under Trump’s policies, on the other hand, understand the stakes involved in this election and that Hillary Clinton is the only practical alternative to Trump. This formulation misconstrues privilege dynamics and misrepresents the identities and considerations of third-party voters and others who refuse to support Clinton, who are far less often White, affluent, heterosexual men than their detractors seem to believe. The status quo is serving many people poorly. Proclaiming that, because the alternative is “worse,” everyone must vote for Clinton – a politician who has championed policies that have actively harmed millions of people both here and around the world – is, at its very best, patronizing to those who are currently suffering. It’s a promise of crumbs instead of a meal with the admonition that starving people better be thankful for crumbs, as the other candidate might take even those away. This rationale plays on the fears of disadvantaged people and those who care about them in order to perpetuate current power dynamics. Its use is in many ways an expression of the very privilege it critiques. Privilege is a multi-dimensional concept, and very few people can claim to speak for the most downtrodden in society. Individuals writing widely read articles about the privilege of third-party voters aren’t refugees from Central America who President Obama is currently deporting – with Clinton’s support, until recently. They aren’t incarcerated for marijuana possession or sitting on death row, likely to stay locked up or sentenced to die if Clinton becomes president. They aren’t living under Israeli occupation, or in deep poverty, or afraid of being obliterated by a drone strike, with little hope for change under the specter of a Clinton presidency. As Morgana Visser recently noted, “many marginalized people are rightfully horrified of Hillary Clinton,” and those accusing nonvoters and third-party voters of privileged indifference to the plight of others have the privilege themselves not to be so marginalized that four, or eight, or indefinitely many more years of incremental change to the status quo is intolerable to them. The thing is, the argument that the Democrats are the only actual alternative voters have to Trump – that the status quo cannot be radically improved and that incremental change is all that is possible – is one that many people cannot afford. Those of us voting for Stein seek to challenge this thinking, to fight for a world in which the most marginalized people are not consigned to deportation, lifetime imprisonment, poverty, or death at the hands of Democrats who are better than Republicans but not nearly good enough. Third-party voting and abstaining from the presidential election altogether are strategies designed to either change the Democratic Party or create an alternative in a political system that has failed disadvantaged populations for decades, as Sebastian Castro points out. It’s perfectly fine to challenge the efficacy of that strategy, and I encourage everyone to read compelling cases for lesser-evilsism in 2016 from Michael Albert, Noam Chomsky and John Halle, Shaun King, and Adolph Reed. I evaluate the risks of Trump relative to Clinton and a lesser-of-evils vote relative to third-party voting differently than they do, but I also have a ton of respect for where they and other social justice advocates like them are coming from. It is wrong, however, for anyone to wield accusations of privilege as a cudgel against those with different electoral strategies, especially because this tactic ignores the voices of Michelle Alexander, Cate Carrejo, Rosa Clemente, Andrea Mérida Cuéllar, Benjamin Dixon, Eddie Glaude, Marc Lamont Hill, Jenn Jackson, Rania Khalek, Arielle Newton, Kwame Rose, Kshama Sawant, Cornel West, and numerous other members of marginalized groups who support alternatives to the Democratic Party and/or believe it’s fine not to vote at all. Those who prioritize identity politics should also remember that prominent spokespeople for the Green Party (including Clemente and Cuéllar) tend to be less privileged than their Democratic Party counterparts, that a woman has been on the Greens’ presidential ticket every single year in which the party has launched a bid for the White House (beginning in 1996), and that the party’s presidential and vice presidential candidates this year – Stein and Ajamu Baraka – are by far the least privileged candidates running. Statistics on Green Party voters in the United States are hard to find, but it’s possible to back out some rough estimates from recent polling. The graph below uses data from four different polls to compare demographic shares among registered Clinton supporters, registered Stein supporters, and all registered voters. Now, to be fair, Clinton voters are more likely than Stein voters to be people of color. But Stein’s share of voters of color is similar to the share in the general population of registered voters; Stein voters are not disproportionately White. Looking at the total population that won’t vote for Clinton, which is a larger universe than the set of registered voters who support Stein, provides an even more striking rebuttal to the those-who-oppose-Clinton-are-White-male-Bernie-Bros narrative. As Visser shows, Reuters data actually suggests that over 40 percent of people of color do not plan to vote for Clinton in 2016. In fact, neither do over 45 percent of the LGBTIQ community, nor the majority of women, “marginalized religious folk,” and people making less than $50,000 a year. None of those statistics change the fact that I, along with many Clinton supporters, am privileged enough to have little to lose from a Trump presidency. But like nearly all Clinton supporters – and unlike the millions of people who, as Visser reminds us, “do not have the privilege of feeling or being any safer under Democrats [as] opposed to Republicans” – I have even less to fear from a Clinton win. Pundits and partisans would do well to spend less time alleging that third-party voters don’t care about the disadvantaged and more time reflecting on why large numbers of people are much more worried than they are about the status quo. The problem, however, is that the Democratic primary was anything but “fair and square.” It may not have been “rigged” in the narrow sense in which some of these writers have interpreted that word (to mean that there were illegal efforts to mess with vote counts), but it certainly wasn’t democratic. That’s why only 31 percent of Democrats express “a great deal of confidence” that the Democratic primary process is fair and is likely why the election conspiracy theories these journalists decry have gained traction. Defenders of the Democratic primary results make several legitimate points. Clinton secured more votes and more pledged delegates than Sanders. When voting rules were less restrictive, she still won a greater number of open primaries than he did. Caucuses, which are very undemocratic, likely benefited Sanders. There isn’t evidence that the Clinton campaign coordinated efforts to purge voters from the rolls, inaccurately tabulate votes, or mislead Sanders’ California supporters into registering for the American Independent Party. While “the American election system is a disaster” and “should be reformed,” it’s not clear that the numerous and alarming voting rights issues that surfaced during the primary (from Arizona to New York to Puerto Rico) systematically disadvantaged Sanders. And discrepancies between exit polls and final voting results can happen for a number of reasons; they aren’t necessarily indicative of foul play. Yet at the same time, these points skirt the very real ways in which the primary process was “rigged;” as Matt Yglesias and Jeff Stein have acknowledged, “the media, the party, and other elected officials [were] virtually uniformly…loaded against” Sanders from the get-go. The thumbs on the scale from these groups mattered a lot, more even than Yglesias and Stein surmise. To quickly recap what those thumbs looked like, the Democratic party threw so much institutional support behind Clinton so long before she even declared her candidacy that political scientist David Karol asserted, in December of 2014, that “Hillary has basically almost been nominated.” The Democratic National Committee’s debate schedule was “obviously intended” to insulate Clinton from challengers and scrutiny. The DNC, in response to inappropriate behavior from a Sanders staffer who DNC staff had recommended and the campaign had already fired, suspended Sanders’ access to important voter data in violation of its contract with his campaign. While Clinton was dinging Sanders on his ostensible disregard for party fundraising, the “so-called joint fundraising committee comprised of Clinton’s presidential campaign, the Democratic National Committee and 32 state party committees” was exploiting loopholes in campaign finance laws to funnel the bulk of its resources to Clinton and Clinton alone. Even into late May, DNC Chair Debbie Wasserman Schultz was leaning heavily into biased, anti-Sanders messaging, and leaked emails confirm that she and other DNC leaders actively sought to undermine the Sanders campaign. In addition, leaders of numerous groups traditionally affiliated with the Democratic party – unions and organizations generally more aligned with Sanders than Clinton on campaign issues – endorsed Clinton without polling their members (the groups that did open the endorsement process up to members typically endorsed Sanders). Mainstream pundits and analysts were hardly any better than the Democratic party. From the moment Sanders entered the race, the media insisted – when they covered him at all, which was not very often – that he had “no chance of winning.” They continued to write off the possibility of a Sanders victory even as his popularity skyrocketed and he took an early lead in the popular vote, inappropriately including superdelegates in their reporting to make it look like Clinton was winning big. They asserted that the hundreds of policy wonks in support of Sanders’ ideas didn’t exist, subjecting Sanders’ proposals to far more scrutiny than Clinton’s, getting their analysis of some of Sanders’ plans flat-out wrong, and attempting to “boot anyone not preaching from the incrementalist gospel out of the serious club.” They began to pressure Sanders to drop out well before even half of all primaries and caucuses had been completed. They helped advance the false narrative that angry, sexist, illiberal White men fueled Sanders’ rise when his supporters were typically more power-balancing than Clinton’s and he was actually most popular among young women, young people of color, and poor Americans. They also helped the Clinton campaign propagate numerous misleading and/or untrue attacks on Sanders. In general, as often happens when political and media establishments are threatened, they progressed from “polite condescension” towards the Sanders campaign to “innuendos” to “right-wing attacks” to “grave and hysterical warnings” to something close to a “[f]ull-scale and unrestrained meltdown.” It’s not clear exactly how much of that progression was coordinated, but it takes minimal effort to dismantle the claim that the Democratic party and mainstream media outlets were mostly neutral. Whether Clinton surrogates were praising her on TV without disclosing their ties to her campaign or technically unaffiliated newspaper outlets were blasting Sanders in headlines and post-publication edits to their articles, media sources consistently parroted misleading Clinton campaign talking points. Evidence indicates that the DNC was along for the ride. It is true that Clinton faced a large amount of negative media coverage herself – much of it in the summer of 2015 and by some metrics the most out of any presidential candidate – and it is also true that the Sanders campaign had its issues, especially when it came to reaching out to and addressing the concerns of older Black voters. But that doesn’t change the fact that Clinton got way more coverage at a critical juncture of the race, a huge asset because “[n]ame recognition is a key asset in the early going [and,] even as late as August of 2015, two in five registered Democrats nationally said they’d never heard of Sanders or had heard so little they didn’t have an opinion.” It also doesn’t change the fact that Clinton was considered the de facto nominee even when media coverage was otherwise unfavorable, a dynamic that surely benefited her among Democrats who prioritize uniting the party in the general election above all else. Though Sanders’ popularity increased as voters became more familiar with him, the initial lack of media coverage of his campaign, Democratic party opposition to his candidacy, and the idea that a Clinton win was inevitable all hamstrung him greatly. If the media coverage he received had been more equitable and accurate, it is easy to show that he might have been the Democratic nominee. That’s why, when writers argue that superdelegates did not “decide the nomination for Clinton,” they’re only half-right. Clinton certainly won the popular vote under Democratic primary rules, but the superdelegates’ early allegiances and the media’s reporting on those allegiances also certainly influenced that popular vote. Roadblocks from Democratic party elites and misleading or downright untrue attacks from the Clinton campaign, its many high-profile surrogates, and the mainstream media were ubiquitous throughout the primary process and certainly influenced the vote as well. As Glenn Greenwald summarized, premature media reports that Clinton had won the election on June 6, besides depressing turnout in the next day’s primaries, constituted “the perfect symbolic ending to the Democratic Party primary: The nomination [was] consecrated by a media organization, on a day when nobody voted, based on secret discussions with anonymous establishment insiders and donors…[T]he party’s governing rules are deliberately undemocratic; unfair and even corrupt decisions were repeatedly made by party officials to benefit Clinton; and the ostensibly neutral Democratic National Committee…constantly put not just its thumb but its entire body on the scale to ensure she won.” Combine many Democrats’ staunch denial of these problems with undemocratic voting practices that have favored Clinton and that her supporters have too often downplayed, and it’s little wonder that some people believe the election was a sham. Journalists who disagree should absolutely make their case. They should also, however, more seriously consider where voters’ concerns come from and stop insisting the system isn’t “rigged.” People think “the entire political process is unfair” because it is. And many doubt that “the outcome of the [Democratic primary] process was legitimate” for good reason. It’s not Sanders’ responsibility to convince people that the primary was something it wasn’t. It’s our collective responsibility to fix our democracy in the months and years ahead. Sanders has some ideas for how to go about doing that, and they’re a good start, but there’s still much more to offer in this area. Stay tuned. Update (7/23/16): The following sentence fragment was added to this piece after a Wikileaks release of DNC emails: “and leaked emails confirm that she and other DNC leaders actively sought to undermine the Sanders campaign.” In addition, an earlier version of this piece contained a sentence that read “New evidence suggests that the DNC was along for the ride,” but that sentence was updated to read “Evidence indicates that the DNC was along for the ride” due to corroborating evidence in the Wikileaks release. Update (10/8/16): Another email leak provides further confirmation that the DNC “anointed [Clinton] the presumed nominee even before the campaign formally began,” as Michael Tracey notes. These claims, however, are missing vital context. Trump would probably make a really bad president, but far from being a unique disaster, his nomination may have actually been the best-case outcome of this year’s Republican primary. There is, of course, a very legitimate concern about the costs of such unconcealed racism from a prominent public figure. Trump “has given people permission to openly trumpet views they may once have kept to themselves — and gives them a place to gather together.” Violence is a predictable result of these gatherings – especially considering the fact that Trump has at times encouraged it – and we’ve already seen it happening at Trump rallies all over the country. At the same time, it’s not like the pre-Trump era was free from violent White supremacy, and when racism and other forms of discrimination are easily identifiable, they’re much easier to confront. Consider, for example, Trump’s despicable proposal to ban Muslims from the country. Given that American society has persecuted Muslims intensely for the past 15 years and that the mainstream media and numerous politicians – again, in both major parties – have facilitated this persecution, it’s hard to believe we’d be seeing the same outrage about the ban (let alone legislation intended to thwart it) if it had been proposed in more coded language by someone perceived to be more mainstream. In fact, survey evidence highlights this point; Democratic support for a Muslim ban grows from 25 percent to 45 percent when voters don’t know the ban is Trump’s idea (Republican support is above 70 percent whether voters know it’s Trump’s idea or not). Marco Rubio’s comment that Trump “says what people wish they could say [but] can’t [because of] consequences, here and around the world” is telling. The consequences are in the form of popular backlash, and it’s the fear of that backlash, in part, that’s driving Right-wing opposition to the Republican nominee. Radio and television personality Glenn Beck, for instance, worries “that the GOP is going to be completely racist – whether it’s true or not – because of Donald Trump. You will never have another Republican president ever again.” Beck is likely wrong about his electoral prediction, unfortunately, but he may be right about Trump exposing the racist, sexist, and xenophobic elements of America that are particularly prevalent in the Republican party. It’s perfectly rational to fear having those prejudices out in the open, but that exposure could also be what’s necessary to begin to dismantle them. The other reason a lot of prominent Republicans don’t like Trump is that, as Nate Silver put it back in September of 2015: “There’s an alternate reality in which he decided to run as a Democrat instead — he wouldn’t have to change his policy positions all that much.” That was certainly the argument of Ted Cruz, who complained in a Super Tuesday speech about, among other things, Trump’s support for “socialized medicine,” Planned Parenthood, “compromise…on Supreme Court nominees,” and neutrality when it comes to Israel and the Palestinians. The man Trump calls “Lyin’ Ted” described most of Trump’s positions incorrectly, but there was also an element of truth in what Cruz told his supporters. Despite Trump’s promise to repeal Obamacare during the primary, he’s also said, to the chagrin of his Republican foes, that he wants to replace it with more universal coverage; he’s even been a supporter of single-payer health care in the past. Though Trump has argued for defunding Planned Parenthood, he’s also maintained, unlike other Republican candidates, that he has “a lot of respect for some of the things they do.” It’s hard to know what Trump would do with the Supreme Court – as one legal scholar mused in March, he’s a real “wild card” – but unlike most Republican candidates (John Kasich is another exception), he has floated less insane justices in the past. On Israel and Palestine, Cruz actually got Trump’s prior statements right, and while Trump recently spoke much more hawkishly about the conflict, that may be in response to Hillary Clinton’s “attempt to cast herself to Trump’s right” on the issue. It’s hard to know for sure what Trump believes – “his hair has been more permanent than his political positions,” as AEI’s Thomas Miller said last July – but there are actually a few domains in which Trump might have better policy positions than Clinton. Trump and Clinton both say they oppose the Trans-Pacific Partnership, for example, but while Trump’s opposition isn’t quite for the right reasons, it’s fairly credible; Clinton’s, on the other hand, isn’t. While Clinton and her supporters make arguments more extreme than Antonin Scalia’s in defense of her big money donors and speeches at Goldman Sachs, Trump is telling the truth about the influence of money in politics (which he openly admits that he has benefited from as a donor and, like Clinton, pledges to reform). Trump says he wants a much bigger investment in infrastructure than does Clinton, and there’s a legitimate case to be made that, in general, Clinton has a bigger “appetite for military engagement abroad” than Trump does. In other areas, Trump’s positions may be less extreme than his primary posturing suggests. For example, he now says he is open to raising the minimum wage, he initially frowned upon North Carolina’s anti-transgender bathroom law, and there are indications that he may walk back his plans to build a wall between the United States and Mexico and deport millions of immigrants. To be clear, he hasn’t given a number on the minimum wage, he decided North Carolina’s law was a state decision in response to pressure from Republicans, and he has not yet pulled support for a border wall or deportations. His positions here are completely unacceptable, as are his tax plan and his statements on guns, torture, and much else. Furthermore, as mentioned above, it’s hard to know whether he would adhere to anything he’s said, and it would be a serious understatement to say that his advisers inspire little confidence. But it’s also important to remember that it’s hard to know what Clinton truly believes, that there is cause for concern about who her staff would be, and that she was absent from the fight for a higher minimum wage, opposed to marriage equality, and supportive of border barriers and deportations until relatively recently, when the right positions (pro-large minimum wage increase, pro-marriage equality, anti-border barrier, and anti-deportations) became politically advantageous for a Democratic Party politician. That certainly doesn’t mean fears of Trump are unfounded. But let’s also make sure we give his candidacy the appropriate context. In Pennsylvania, the biggest delegate prize on Tuesday, April 26, 11 percent of Democratic primary voters indicated in exit polls that “electability” was the “candidate quality” they cared about most. Of those voters, 83 percent cast their ballots for Hillary Clinton. The results were similar in Connecticut and Maryland and have been pretty consistent throughout the entire country; the 8 to 21 percent of voters who value electability more than anything else have overwhelmingly voted for Clinton in every state in which exit polling is available except Vermont (where Clinton got “only” 50 percent of the votes based on this criterion). The strongly held belief among Democratic primary voters – at least, those Democratic primary voters who care most about the electability criterion – seems to be that Clinton is more likely than Bernie Sanders to win a head-to-head general election matchup. This belief, however, is completely at odds with the evidence. Polling data and voting results clearly imply that Sanders would match up better against any of the Republican candidates than Clinton would. If voters who cared about electability had been aware of this evidence when voting, Sanders could very well be on his way to wrapping up the Democratic nomination (rather than facing a very narrow, though not impossible, path to victory). I don’t personally value perceived electability very much: I care more about candidate records and values, electability often ends up being a self-fulfilling prophecy and, given that it requires speculation about numerous unknown factors, electability cannot be gauged with certainty. But I’ve written about it during this election cycle both because there are people who do care and because a fact-free media narrative about electability has been sowing misinformation among Democratic primary voters. Head-to-head polling matchups against potential Republican candidates are the most direct evidence we have on the question of electability. 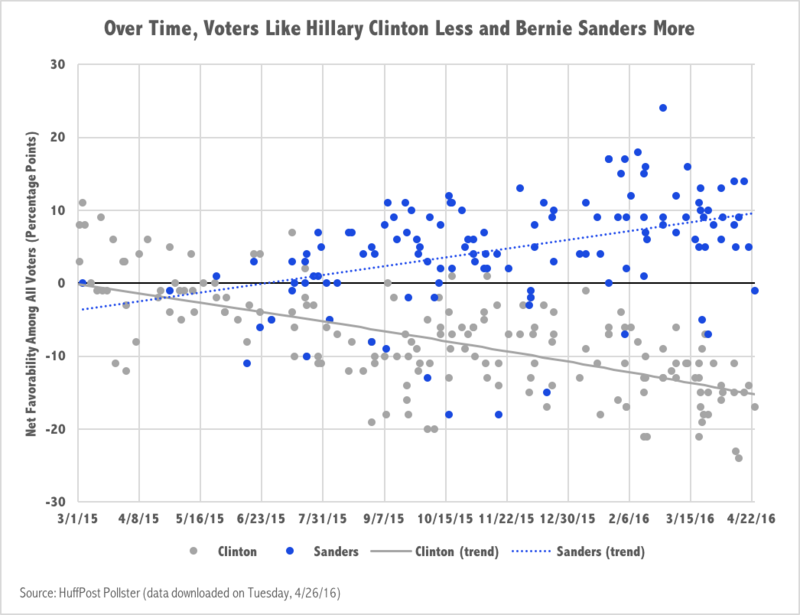 As the graph below illustrates, those polls clearly favor Sanders, and they’ve done so since before voters in the first primary state (Iowa) headed to their caucus locations. Pundits continue to insist, as they have for months, that these poll results are “meaningless” (or, at best, that they “overstate [Sanders’] general-election prospects”). They argue that Sanders “hasn’t been attacked” yet by Republicans and that, if attacks began to air, “his advantage over [Clinton] would disappear.” Yet Sanders has been attacked by the GOP; Donald Trump has been calling Sanders a “maniac” and “communist” for the last six months, Right-wing media outlets have been telling people that, under Sanders, “your paycheck will feel the Bern,” and Future 45, a Republican Super PAC, launched an ad campaign back in February intended “to start educating Americans about [Sanders’] out-of-touch record.” In fact, the “glaring [general election] vulnerabilities” one columnist described Sanders as having back in February – being old, being labeled a “socialist,” and wanting to raise taxes – are all things that Hillary Clinton and/or her surrogates have already attacked him for during the primary season. GOP operatives would surely intensify their attacks on Sanders if he became the Democratic nominee. But the fact of the matter is that head-to-head polling in April is often predictive of general election outcomes and that, in spite of numerous attacks leveled against him over the past few months, Sanders’ popularity has continued to rise steadily. Clinton’s popularity, as the chart below shows, has been consistently headed in the opposite direction. In addition, young voters, who “arguably won both the 2008 and 2012 elections for Barack Obama,” prefer Sanders to Clinton by very large margins. So do Independents. If the Democrats want to secure these critical voting blocs in November, the next two graphs strongly suggest that they’d be best off with Bernie Sanders as their nominee. In short, the electability evidence overwhelmingly favors Sanders, and most voters who have seen it, as I’ve been unsurprised to discover while phone banking and canvassing on Sanders’ behalf, find it convincing. The problem is that most people haven’t seen it and/or have been told, erroneously, that it doesn’t matter; that’s the most likely explanation for the exit poll results we’ve seen thus far. Just for fun, I decided to see what the election would look like in an alternate universe, one in which this evidence was widely available to all voters. Those who prioritized electability would at the very least split evenly between the two candidates, but would more likely vote for Sanders in margins as large as those by which, in the actual results, they’ve broken for Clinton. Holding every other voter’s preferences constant, these scenarios would have drastically shifted election outcomes. If voters prioritizing electability had been equally as likely to break for Sanders, Sanders would have won Connecticut, Illinois, Iowa, Massachusetts, Missouri, and Nevada. Clinton’s pledged delegate lead would have fallen from 287 to 129, a total that would have been viewed as surmountable. And if Sanders dominated among these voters, he would have won New York, North Carolina, Ohio, and Pennsylvania as well. 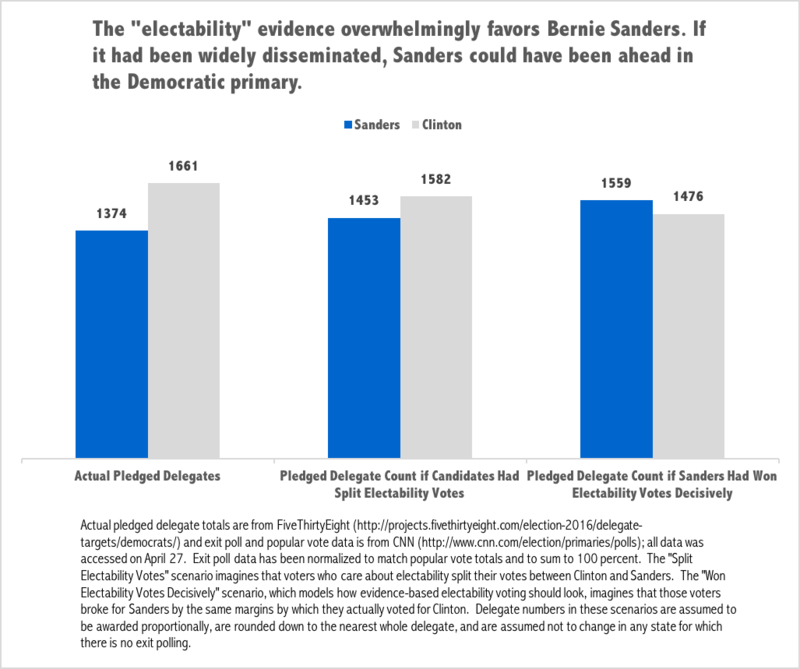 As the graph below shows, increased awareness of electability evidence could very well have put Sanders ahead of Clinton by 83 pledged delegates. In other words, if the facts on electability had been publicized and everything else had remained constant, Sanders might today be the frontrunner for the Democratic nomination. That’s obviously a huge “if” and it doesn’t in any way change reality: Clinton is winning big and time is running out. But electability hypotheticals provide some insight into how the 2016 Democratic primary process, like far too many of our public debates, has been driven more by misleading media narratives than by the facts. I know, I know – as Sanders likes to remind us, “telling the truth” is considered a “radical idea” in American politics. But as his candidacy has also underscored, that certainly doesn’t mean we shouldn’t do it. At a rally on Thursday night, Greenpeace activist Eva Resnick-Day approached Hillary Clinton to ask a question. Her exchange with Clinton was caught on video and is shown and transcribed below. Resnick-Day: Yeah, and registered lobbyists. Clinton: I am so sick of the Sanders campaign lying about me. I’m sick of it. Resnick-Day has nothing to do with the Sanders campaign – she works for Greenpeace. Given these facts, it is perfectly fine for Hillary Clinton to note that, while she has taken money “from people who work for fossil fuel companies,” she has not taken any from the companies themselves. It was also perfectly correct, however, for Resnick-Day to add “and registered lobbyists.” And since nothing Clinton was confronted with here was new, false, or generated by the Sanders campaign, Clinton’s claim that the “Sanders campaign [was] lying about [her]” was entirely unfair and divorced from reality. Those defending Clinton have made a few reasonable points about the interpretation of the facts above. Some have observed that the Sanders campaign has also received some money – about $54,000 – from individuals associated with the oil & gas industry and that Clinton’s haul from that industry comprises a small fraction of her total campaign contributions (the plurality of which come from individuals associated with Wall Street). Others have noted that her lobbyist bundlers don’t exclusively hail from the oil and gas industry; they lobby for other corporate clients as well. Yet it is wrong to assert, as some writers have, that donations to Clinton’s Super PACs shouldn’t count – there is close coordination between those Super PACs and her campaign – and it is undeniable that people associated with oil and gas interests like Clinton a whole lot better than they like Sanders. Does that mean that Clinton is bought and paid for by energy interests? Not necessarily. But it’s important to note that, while a “sizable chunk of Sanders’ plan takes aim at the fossil fuel industry” by, among other things, banning fossil fuel lobbyists from the White House and ending subsidies to fossil fuel companies, Clinton’s doesn’t go there. It’s important to note that, while Sanders is a staunch opponent of fracking, Clinton conditionally supports it. And it’s important to note that, before Clinton’s recent changes of heart about the Keystone XL pipeline, Arctic drilling, and the Trans-Pacific Partnership in response to pressure from Sanders and climate activists, she didn’t appear particularly interested in taking bold action on climate change. It’s just as possible that Sanders’ climate plan being better than Clinton’s has caused the fossil fuel industry to like Clinton better as it is that the fossil fuel industry has caused Clinton’s plans to be worse, but neither possibility is particularly comforting to those of us who care about the environment. It makes sense that Clinton doesn’t want Sanders discussing these facts: they don’t look particularly good for her. But neither climate activists nor the Sanders campaign is lying about anything here. Claims to the contrary from the Clinton team and her prominent supporters only serve to show that it’s easier for them to pretend than to defend Clinton’s record. A nontrivial portion of online comments are going to be unconstructive and/or offensive. Especially when a columnist writes something provocative, a lot of people are going to be unhappy about it, and many of them, bolstered by the relative anonymity and psychological distance the Internet affords, will respond with vitriol. That said, there are actually a lot of thoughtful readers out there, and even angry responses can sometimes contain good points. Authors who take the time to consider the feedback they receive – to parse the constructive commentary from the trash – can improve their arguments and demonstrate that they’ve really thought through the fairness and implications of what they’ve written. Unfortunately, many authors don’t do that. And during this election cycle, this failure in self-reflection has been particularly prevalent among prominent Hillary Clinton supporters. They’ve got wide readership. Krugman is much more well-known and writes for the New York Times, but Tomasky has a decent following in his own right; he’s a columnist for the Daily Beast and also edits Democracy: A Journal of Ideas. They routinely (and fairly) excoriate Republicans for advocating for illiberal ideas and/or distorting the truth. They’ve written multiple pieces in support of Clinton that express illiberal ideas and/or distort the truth – that is, they’ve done exactly the type of thing they frequently ding Republicans for doing. There are numerous examples of Hillary Clinton supporters who make sexist, racist, and homophobic comments as well. Whether you’re subject to such comments is both a function of which candidate you support and how much privilege you have (women and people of color who support any candidate are much more likely to be harassed than White men like Krugman and Tomasky or half-Indian men who are perceived to be White like me, for instance). So let’s not go around calling people “Hillary Elites” or “Hillary Straights” or “Bernie Bros.” Instead, let’s condemn harassment without opportunistically twisting the truth about it and focus our energy on substantive debates about issues. The Sanders campaign’s critiques of Clinton’s record and platform have been significantly fairer than the Clinton campaign’s misleading and/or untrue attacks on Sanders. The only specific “attack” on Clinton that Tomasky actually attributes to Sanders is his call for Clinton to release the transcripts of three speeches Goldman Sachs paid her $225,000 (each) to make during the past few years. But Sanders’ critique here is completely fair (as is what Tomasky calls Sanders’ “anti-Rahm Emanuel tincture”). Clinton has repeatedly claimed that the money she receives from Wall Street doesn’t influence her; the American people have a right to know how her remarks to bankers comport with her professed commitment to regulate them (though how her comments could possibly look as bad as her continued refusal to share them is anyone’s guess). To be fair, the precise definition of “attack” is open for debate, but despite Krugman’s assertions to the contrary, the fact that Clinton’s campaign has been much more insidious isn’t. Throughout the primary, the Clinton campaign has repeatedly distorted the truth. Clinton has disingenuously accused Sanders of sexism and racism, made false statements about his health care plan and history of health care advocacy, and misled the public about his record on the auto industry, immigration, Wall Street, and a variety of other issues. Her team has also engaged in red-baiting, trashed taxes Democrats are supposed to support, and co-opted the language of intersectionality to inaccurately paint Sanders – a rare politician who recognizes the connections between social and economic issues and is advancing a comprehensive social justice agenda – as a single-issue candidate. Clinton’s campaign might not embody “the most negative campaign of any Democratic presidential candidate…in a presidential primary season” label that her staffers have tried to apply to the Sanders campaign, but the Clinton team’s tactics have been – by far – the most negative in this year’s race. Sanders has a very strong track record as a legislator and executive. Tomasky also fails to mention that Sanders has mastered the art of adding power-balancing amendments to larger bills; his accomplishments include (but are not limited to) securing funding for community health centers in the Affordable Care Act, blocking imports made with child labor, and increasing transparency about one-time government officials’ subsequent employment opportunities. Sanders’ record as mayor of Burlington also shows that he’s an excellent executive. He has a history of setting big goals, fighting for them, and eventually working out the best deal he believes he can. The citizens of Vermont love Sanders for a reason – they know his record a lot better than Krugman and Tomasky do, and it’s a damn good one. If anything, I’d prefer Sanders were much less into what Krugman calls “hardheaded realism” than he actually is. That’s because Krugman is wrong about how to make change; we are served best not by “accepting half loaves as being better than none,” but by reframing issues and forcing policymakers’ hands. As climate expert Bill McKibben explains, major accomplishments like gay marriage and civil rights legislation weren’t driven by leaders all too willing to compromise; they were driven by “big, impassioned movement[s] that cleverly changed the zeitgeist.” Sanders gets this dynamic more than any major presidential candidate in recent memory, and that’s why his “political revolution” carries so much potential to change this country’s politics. 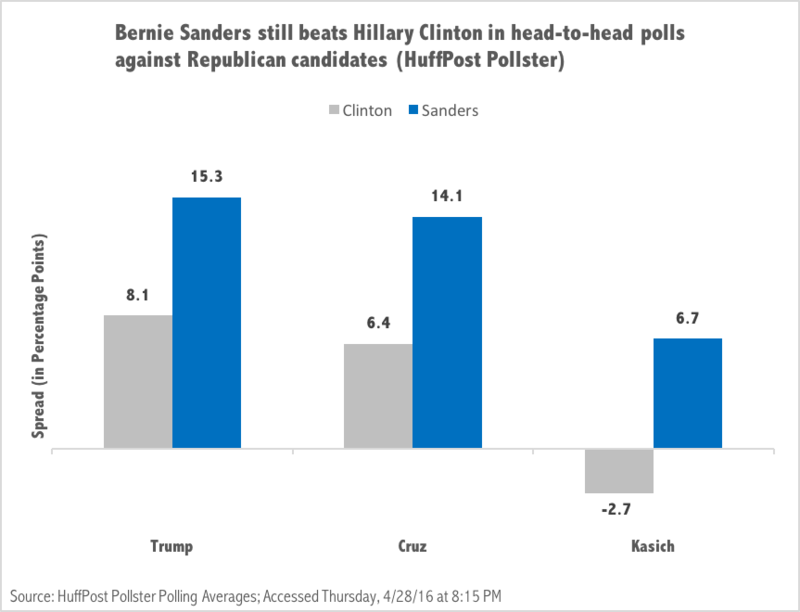 All the evidence suggests Sanders is a more “electable” general election candidate than Clinton. Both Krugman and Tomasky write off the head-to-head polling that has consistently shown Sanders to outperform Clinton in hypothetical general election matchups with Republicans. Tomasky argues that “a billion-dollar onslaught” from the GOP, targeted at the “tax increases he’s proposing,” would tank Sanders. Yet as I’ve explained before, the GOP would also mercilessly attack Clinton, and the idea that those attacks would work better against Sanders is entirely inconsistent with other polling trends. As shown below, Clinton’s favorability ratings have been steadily declining, while Sanders’ have continued to rise as voters have become more familiar with him. As I’ve also explained before and the graphs below show, Sanders does significantly better than Clinton among two demographic groups key to winning a general election: young people and Independents. Voters in these groups – unlike voters in Clinton’s key constituencies – may very well abandon the Democrats if Clinton is the party’s nominee. I wouldn’t personally recommend basing your vote on perceived electability, but if that’s what you’re planning to do, the evidence indicates that you should vote for Sanders. There are substantial, important differences between Sanders and Clinton. These differences are in some respects much larger than the differences between Clinton and various Republicans. Krugman argues that the differences between Sanders and Clinton “are trivial compared with the yawning gulf with Republicans.” Ironically, the context for those comments – an article about financial policy and donations – provides a compelling counterexample: Wall Street does not like Sanders, but the industry seems to like Clinton more than many of the Republican candidates, as the graph below shows. And though many of them likely agree with Krugman that the differences between Clinton and the Republicans are larger than those between Sanders and Clinton, numerous smart people and policy experts whose existence Krugman ignores believe both that Sanders’ Wall Street plans are much better than Clinton’s and that Sanders is far more likely than Clinton to surround himself with a staff that will execute a power-balancing policy vision. For an even better example, consider foreign policy. Clinton has embraced an incredibly hawkish position on Israel, used the same foreign policy consulting firm as Marco Rubio and Ted Cruz (among other politicians), and supported a coup in Honduras in 2009; in fact, she has earned the support of many neoconservatives for her long history of supporting civil liberties violations and aggressive interventions that have resulted in the mistreatment and/or deaths of millions of innocent people. Tomasky is right to point out that Sanders’ doesn’t get particularly high marks on foreign policy from “actual leftists,” but there’s a reason Congresswoman and Iraq War veteran Tulsi Gabbard resigned from the Democratic National Committee to endorse Sanders at the end of February (see video below): he’s much less imperialistic than the typical major party candidate. Then there’s the death penalty: Sanders opposes it, but Clinton, like the Republicans, is okay with it. There’s also the subject of immigrants’ rights: Clinton’s professed outrage over Donald Trump’s proposal to build a wall along the Mexican border is hard to reconcile with her repeated support for a border barrier in the past, support she touted as recently as November 2015. Her newfound commitment not to deport children fleeing violence is also hard to believe given her defense of such deportations a mere seven months ago. In contrast, Sanders has consistently opposed both a border fence and deportations. From Clinton’s support for the escalation of the War on Drugs and move to more draconian welfare policy to her longtime opposition to gay marriage to her promotion of “free trade” deals that have prioritized the interests of multinational corporations over those of the bulk of the world’s citizens, Clinton’s history is closer to many Republicans’ than to Sanders’, who has a very good (albeit imperfect) record on racial justice issues, anti-poverty work, LGBT issues, and opposing bad trade deals. To be sure, there are some causes on which Sanders has found Republican allies, but those causes have generally been ones – like opposition to corporate welfare – that Tomasky’s “actual leftists” support. In light of all these facts, Tomasky’s argument that Democrats should refrain from criticizing Hillary Clinton (who he thinks will be the Democratic nominee), like a similar argument from Markos Moulitsas at Daily Kos, is a hell of a lot scarier to people like me than a Donald Trump presidency. This undemocratic idea elevates party tribalism over good policymaking and “winning” over holding politicians accountable. It presents a major obstacle to the change the world’s most disadvantaged populations desperately need, change which perpetual endorsements of lesser-of-two-evilsism will never deliver. Such a misguided notion of “political pragmatism undermines progressive goals,” as I’ve argued before. Sanders still has a legitimate shot to win the Democratic primary. Half the country still hasn’t cast their ballots and Bernie Sanders isn’t all that far away from the pledged delegate targets he’d need to win the nomination; Tomasky is wrong to assert that “Sanders can’t win the delegate race now.” Yes, winning will be difficult, but there’s still a clear path for him to do so, and as Sanders’ historic upset win in Michigan shows, an election isn’t over until the voters actually cast their ballots. Krugman thinks an extended primary isn’t “good for the Democratic party;” I, on the other hand, think the Clinton coronation he and the Democratic party Establishment have been pushing is a whole lot worse, as it flies in the face of a lot of what the party is supposed to stand for. All of that said, Krugman and Tomasky are right about one thing: Sanders supporters should avoid the reflexive attribution “of foul and malevolent motives” to Clinton supporters. I know a lot of awesome Clinton supporters who do great work. People support presidential candidates for a variety of reasons, and instead of jumping to conclusions about the character of those who disagree with us, we should listen to those reasons and evaluate them on their merits. In fact, I’d urge everyone to extend the same courtesy to Bernie Sanders supporters, to Jill Stein supporters, to those who refuse to vote, and yes, even to people who plan to vote for one of the Republican candidates. We should consider the possibility that others have thought through their electoral choices and have entirely legitimate reasons for making them. At the same time, ethics and evidence matter, and it’s perfectly fine – in fact, it’s essential – to hold voters accountable for attending to them. If you say your top priority is raising the minimum wage to $15 an hour, for example, you can’t possibly defend a vote for a Republican this year. You also can’t really explain a vote for Clinton, which is why Sanders supporters were justifiably furious when the Service Employees International Union endorsed Clinton in November. I suspect that Krugman and Tomasky don’t share all of my values and priorities. We agree on a lot – I enjoy their writing outside of election season and appreciate much of what they advocate for – but they seem much more comfortable with the policy status quo than I am. I reject the idea that public policy must inevitably leave millions of people behind; they very well may not. In Tomasky’s words: “Fine. I can appreciate that.” If more voters share Krugman and Tomasky’s values than share mine, so be it. The problem, however, is that Krugman and Tomasky haven’t been writing about value disagreements. Instead, rather than acknowledging and responding to the evidence and logical arguments that contradict their claims, they’ve continued to pen inaccurate and/or highly misleading articles for popular media outlets. Is it any wonder that, in response to such widely read misinformation, they’ve received angry responses from Sanders supporters? My best guess is that Krugman and Tomasky are suffering from a severe case of confirmation bias: they’re convinced that Clinton is the best option and have developed tunnel vision to avoid the cognitive dissonance that actually considering feedback might bring about. But that doesn’t make what they’re doing okay. And given how often they assign “foul and malevolent motives” to Republicans who write fallacious things, they’d do well to reflect on why it is that their readers have recently been doing the same thing to them.